Slipknot have shared a short video teasing vocals from their new album. The follow-up to 2014’s .5: The Gray Chapter will be released on August 9 and is expected to feature the single All Out Life, which the band revealed on Halloween last year. 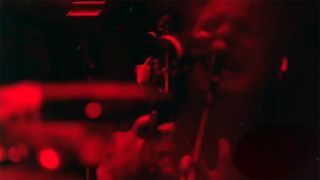 Now they’ve teased fans with a one-minute video clip, which features distorted and slowed-down vocals which are accompanied by footage of vocalist Corey Taylor and film from inside the studio. The glitchy clip also has various words scattered throughout, including “universal leader”. Check it out below. Slipknot will head out on the Knotfest Roadshow with Gojira, Behemoth and Volbeat across North America this summer. Before those dates get under way, Slipknot will play shows across Europe, including a headline set at the UK’s Download festival – but they’ll be without Chris Fehn, who quit the band last week. Yesterday, UK rapper Kid Bookie released a new version of his 2018 track Stuck In My Ways featuring a guest appearance from Taylor.